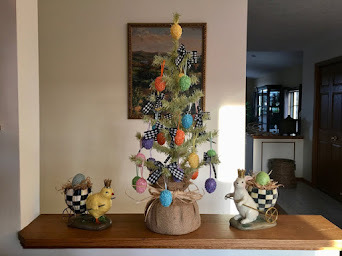 Home and Gardening With Liz: Ti's the Season! Ti's the season for sure! I've only begun to think about my holiday decorating, no tree up or mantel decorated just yet! Since this will be just a casual meal I chose my Fleur-de-lis black and white checked tablecloth. came in to play too! out so well for many different themes. Today they remind me of the snow blowing and whirling around! them at T.J. Maxx and had to have them! I put them into action! I topped it all off with a coffee mug and a peppermint stick to stir into the coffee! Williams Sonoma (on sale) ya have to keep an eye on them for their sales! I think they will get used a lot for various settings! The red velvet floral ball was from Pottery Barn a few years ago...one of my favorites still! The mercury pieces were more finds from T.J. Maxx- the ornament on top was one I found at a specialty gift shop last year in PA while visiting our son. last year- I love their cute sparkly look! Ooh, I almost forgot the wine! A little Pinot Noir to enjoy! Yep...and I don't have to cook! Liz, this is a gorgeous table! The colors truly "pop"! 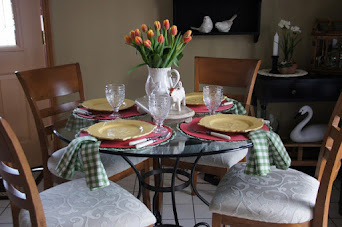 I love the fleur de lis tablecloth; and the red just dazzles with it! The mercury glass is so pretty and the centerpiece just sparkles. Very pretty!! This table setting is so celebratory! The glitz and shine is so elegant. You've got SNOW blowing around there???!?! Poor thing!!! I am dreading when it arrives here! I can't stand the snow! It's pretty to look at the first time it falls, but it is just so dangerous. I get antsy every time my husband leaves for work in the morning, and especially when he's driving home in the dark in it at night. The only thing snow is good for is decorating!!! :-) LOVE your tablecloth!!! I like the fleur de lis design within the checks. That's pretty cool!!! I can't believe I bought those plates at TJ Maxx last year and then actually TOOK THEM BACK!!! What was I thinking!?? I think I bought the chargers, actually. Should have kept those bad boys. My frame of mind wasn't right! You make them look so good here! Mercury glass is really, really big this year. It's a fun part of this table. That's the beauty of it...it can go formal or casual. Love that! Right on, Liz! Great table!!! Very pretty! Love the sparkly Christmas centerpiece...the pieces are great individually but come together beautifully! The two sizes of checks are just fabulous. I just have to say that those chargers are my favorites too. I can use them anywhere anytime. What fun holiday plates and the black polka dot goes great with them. What a fun table. Your table is very festive and I think the black and white pieces work very well. Don't you just love TJ Maxx!!!!! 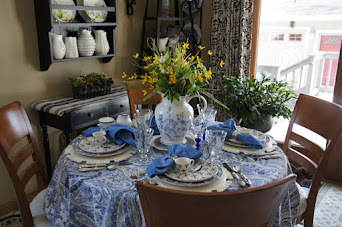 I love the way you have put your Tablescape together for two. The black and white looks so Beautiful together Liz. 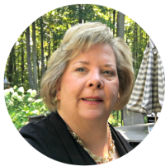 I also love the way Linda did your new blog she is are Blog Angel. 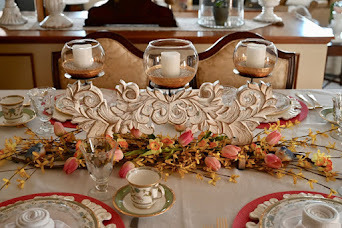 I would like to thank you for your sweet comments on my Christmas Tablescape. Hope you have a great week with your family. The black and white is festive and different. 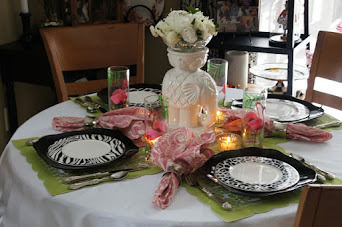 What a fabulous color scheme -- and those "tis the season" plates are darling! I love black and white checks with red. Great job! Gorgeous table...and those lovely chargers I covet, but refuse to buy! Great table linens. The mercury glass makes for a festive centerpiece. 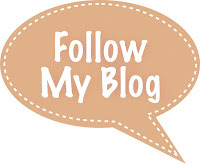 Liz, your blog looks like what is falling outside my window right now! What a fun table--so many of my favorite things! Love the combination of polka dots, checked napkins and peppermint stripes! Sounds like you had fun with this one and it shows! This is so festive and fun --- polka dots always make me smile! Playing with the dishes instead of cooking...even better! Great minds think alike...you and I both chose to introduce black and white checks for a Christmas tablescape. I love your whimsical design. I'm moving a bit slowly with my Christmas decorating, too. Thank you for inviting us for a peak.